Pierre Descamps, Mathieu Schmitt and Xavier Theunis all attended the Villa Arson. Represented by Catherine Issert since they left this art school in Nice, they share a taste for formalism and an economic sense of expression. Avoiding taking a dialectic position, the exhibition 2+1 proposes an original response to the heterogeneous nature of their approaches: it revolves around a central module, both works and the work, to which other works are added, the majority hitherto unseen. 2+1 is thus built around juxtapositions and additions, creating a formal exchange: in place and stead of a statement, the exhibition space becomes a federating and formalising space in which the physical relationship between the works builds potential links. Giving rise to combinations of variable and varied sums, 2+1 opens up multiple paths of possible refl ection: sometimes slanted towards minimalism, the ready-made, conceptual or abstract art, they reveal the partiality shared by these young artists for architecture, design and Pop culture. 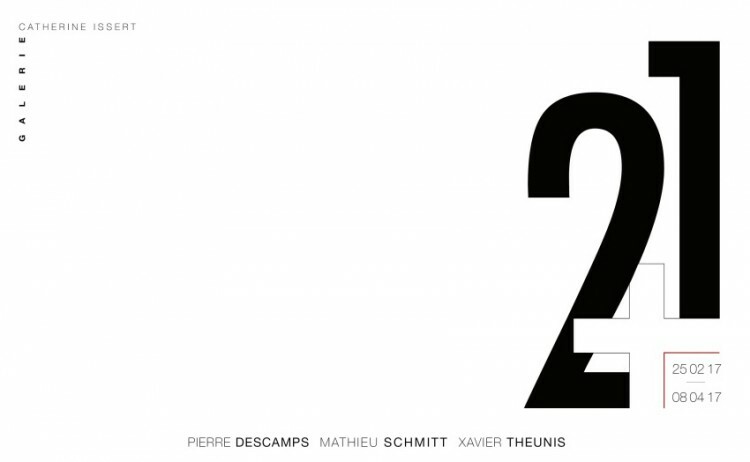 In this respect, Pierre Descamps, Mathieu Schmitt and Xavier Theunis took a special interest in what always precedes an exhibition: 2+1 evokes the transportation of the works from the studio to the gallery. Crates become supports of frontal fi xtures, thus undergoing a metamorphosis to become both dados and minimalist sculptures; stowing rails, scanning the gallery with metallic lines, allowing for the suspension of autonomous modules, and disrupting the traditional white cube. The works hung on these hijacked devices also call upon the esthetics of what is functional, of everyday use: metal tubes, concrete and breeze blocks compose a formal repertory that swings from concrete substance to abstraction.